Jack Holder (blue helmet) and Simon Lambert contest the first heat of the year for Panthers against Coventry. Photo: David Lowndes. Peterborough Panthers’ opening meeting of 2017 could well prove to be a one-off for a variety of reasons. The new-look city team were beaten 57-33 by a classy Coventry side in a Challenge clash at the East of England Showground today (March 19). It is expected to be the only occasion in which all seven of the intended Bees riders take to the track together after the SGB Premiership club’s recent demise. Panthers will also hope the scoreline isn’t repeated at Alwalton during the rest of this season – although they are unlikely to come up against another septet of this calibre. Of course, they were always expected to lose to higher-level opposition, but the 24-point gap between the sides won’t have pleased them. However, the huge turnout certainly did put smiles on the faces of the club’s management team as a large travelling army of Coventry backers contributed to a bumper crowd which many estimated to exceed 2,000. Ulrich Ostergaard sets the pace for Panthers against Coventry in heat three. Photo: David Lowndes. The sheer volume of supporters trying to get into the Showground led to a long delay with the meeting eventually getting underway more than 30 minutes after the scheduled noon start-time. 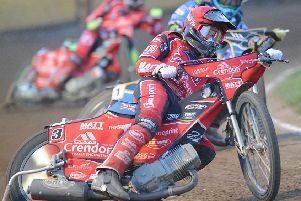 When the action did commence, it was Coventry who controlled the vast majority of the meeting with past Panthers men Danny King and Kenneth Bjerre both going unbeaten by an opponent. Their 11+1-point hauls were bettered by Bees reserve Josh Bates, who was the star performer on the day with paid 13. The Panthers’ display wasn’t without positives as they managed four heat wins and one race advantage. New Panther Bradley Wilson-Dean in action against Coventry. Photo: David Lowndes. Captain Ulrich Ostergaard’s success in heat three earned a 4-2 which briefly brought the hosts onto level terms – a situation quickly changed by back-to-back Coventry 5-1s. The other three Panthers victories came from new recruits with Bradley Wilson-Dean taking heat two, Kenneth Hansen triumphing in heat seven and Paul Starke claiming heat 12. Team boss Carl Johnson said: “It is never about the scoreline in a Challenge meeting. “Ideally we would have kept it a little bit closer, but that was always going to be a tall order against a team I think would have taken some stopping in the SGB Premiership this year. Starke finished as top-scorer with paid nine while Hansen and Ostergaard both rode solidly. New number one Jack Holder looked quick in his opening couple of rides before bringing up the rear when taking a tactical outing in a heat 10 thriller. He was also involved in the other stand-out race of the afternoon in heat 13. Second-string Simon Lambert took a first-bend tumble in the opener – hardly the ideal return from an injury absence stretching back to last July. He quickly picked himself up to complete the re-run in last place, but then got among the points in his remaining riders. Wilson-Dean was unable to add to his success in heat two when drawing a blank in his three subsequent outings, while fellow reserve Tom Bacon was always on the pace despite failing to score. It’s unlikely that Panthers were suited by the track conditions. While the East of England Showground surface apparently drew praise from both sets of riders for its smoothness following some serious winter surgery, it appeared to be lacking in shale. A slick track tends to play into the hands of the quickest starters, and more often than not it was the Bees men who got away from the traps in speedier fashion. There were a couple of edge-of-the-seat contests although both of them - the aforementioned heat 10 and heat 13 - ended in 5-1s to Coventry. The general lack of grip was evident from the race-times which were typically around five seconds slower than those usually recorded at one of the fastest tracks in the land. But Johnson expects it to be a different story this Friday (March 24) when Panthers welcome Scunthorpe for their first SGB Championship outing of the season (7.30pm). He added: “The times tell that the track was slick, but we’ll work on giving the guys the grip they want during this week. PANTHERS: Paul Starke 8+1, Kenneth Hansen 7, Ulrich Ostergaard 6, Jack Holder 5+1, Simon Lambert 4+1, Bradley Wilson-Dean 3, Tom Bacon 0. COVENTRY: Josh Bates 12+1, Danny King 11+1, Kenneth Bjerre 11+1, Lewis Kerr 9, Lasse Bjerre 8+2, Jason Garrity 4+1, James Sarjeant 2+2. 1 – re-run King (62.6), Holder, Kerr, Lambert. 2-4, 2-4. 2 – Wilson-Dean (63.9), Bates, Sarjeant, Bacon. 3-3, 5-7. 3 – Ostergaard (62.4), L. Bjerre, Starke, Garrity. 4-2, 9-9. 4 – K. Bjerre (62.4), Bates, Hansen, Bacon. 1-5, 10-14. 5 – Kerr (63.7), King, Starke, Ostergaard. 1-5, 11-19. 6 – K. Bjerre (62.7), Holder, Lambert, Sarjeant. 3-3, 14-22. 7 - Hansen (63.7), Garrity, L. Bjerre, Wilson-Dean. 3-3, 17-25. 8 - Bates (64.8), Lambert, Kerr, Bacon. 2-4, 19-29. 9 – re-run K. Bjerre (64.0), Ostergaard, Starke, Sarjeant. 3-3, 22-32. 10 - L. Bjerre (64.7), Garrity, Lambert, Holder (t/r). 1-5, 23-37. 11 - King (63.5), Hansen, Kerr, Wilson-Dean. 2-4, 25-41. 12 - Starke (64.8), Bates, Sarjeant, Bacon. 3-3, 28-44. 13 - King (64.8), K. Bjerre, Hansen, Holder. 1-5, 29-49. 14 - Bates (65.7), L. Bjerre, Ostergaard, Wilson-Dean. 1-5, 30-54. 15 - Kerr (65.4), Starke, Holder, K. Bjerre (exc, 2mins). 3-3, 33-57.